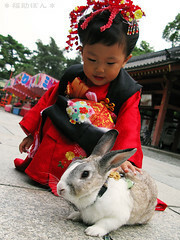 I first blogged about Oolong the rabbit back in 2002. At first Oolong was famous for balancing pancakes on his head but the many photos of his visits to parks and temples in Japan were wonderful and won him a lot of fans around the world. Oolong died a few years ago. I was recently very happy to stumble upon Fusuke-pon, another adventurous Japanese rabbit. He doesn't balance pancakes but he appears in some lovely photographs, also often in parks and temples.